Forgive me as I've posted on this book before, and it's hardly an undiscovered treasure, but I felt like now was the appropriate time in my son's book reading career to fully appreciate Eloise. When I posted on it back in 2008, my son was a toddler, and though he loved Eloise dearly, I don't remember that he did it with the same amount of vigor and understanding that he embraces her with now. "Kleenex makes a very good hat"
Often people ask me what my favorite children's book is and I compile lists in my head or tell people the favorites that I think will most match their tastes. 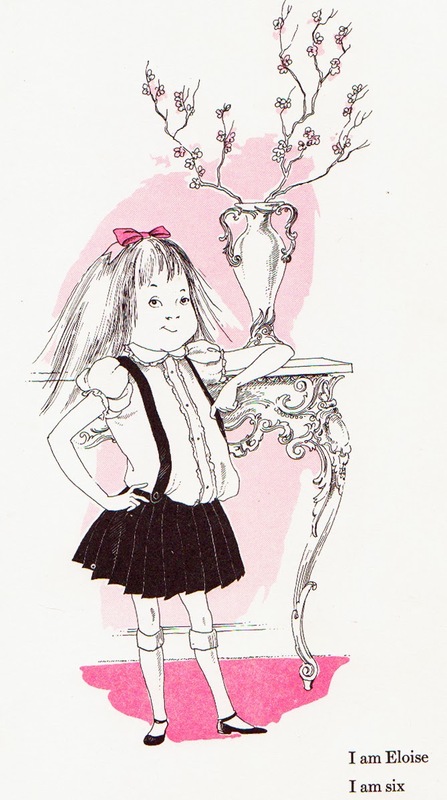 But, unequivocally, if someone were to ask me what my all-time favorite children's book is and/or was, it will always, always, ALWAYS be, forever and always until the end of time... Eloise. The copy we have in our collection now, it not my true childhood copy. My two sisters and I read our original copy so vigorously in our little kid years that by the time I got to elementary school it had long since fallen apart and been lost. Later, when I was around ten years old, my mother took me to the local bookshop and told me I could get anything I wanted. Instead of buying one of the Narnia books, The Wizard of Oz or a Cynthia Voight title, I opted for an upgrade of Eloise. So many of the books in our family library were hand-me-downs from my sisters or shared books, that I remember being so enamored with having a brand new Eloise that was all my own. This copy followed me through high school, to my dorm room at college and to my first apartment in Williamsburg, Virginia, and my second apartment at 404 West 51st Street in New York...eventually finding its way to my son's bookshelf. When I was young and my mother would take us on trips to New York, we would load in a cab and go on mecca to The Plaza for ONLY one reason. That is where Eloise lived. I could spend hours looking at that book, even in high school, getting lost in the illustrations, chuckling over the hidden treasures tucked within each. It is an absooooolutely PERFECT book, from beginning to end in both words and pictures. I could go on and on about images and moments I love in this book. The foldout elevator sequence where Eloise movements in the text are mapped out exactly in a dotted arrow line. How all of her imaginary scenarios are inked out in a red (pink? ), sometimes so faint, it almost seems like they are not there at all. Weenie (the dog that looks like a cat), Skipperdee (the turtle that loves strawberry leaves), and Nanny (the beer loving boxing fan)! Each and every character, a dream. My son always loved it as a wee one, but for several years it has sat untouched on the back of his bookshelf (that, BTW, is so overloaded, each shelf is two or three books deep, and once things get lost in the back row, they are often never heard from again.) A few weeks ago, it managed to squirt itself back up to the front row, and I read it to him at bedtime, and the giggling commenced. And when I say giggling, I really mean chortling, belly laughing, screaming and screeching hysterically. So for the past few weeks, it feels like Eloise makes her way to the top of the read pile each and every night. My husband is now convinced that Eloise is psychotic... as evidenced by the pictures below, and whenever he states this fact aloud, it just makes my son howl all the more. (The gin, the nailing of the chair to the floor, the sawing of the doll in half, the bizarre role playing... literally, I could go on and on.) My son thinks the fact everything Eloise owns is wrecked is outrageously awesome. I have come to the conclusion that Kay Thompson, Hillary Knight and my son are cut from the same cloth, and, in fact, share the exact same sense of humor. He finds the oddest lines to be so massively funny that he has trouble breathing at least five times in a read through. It slays him each and every time. Go figure. This book. Always, always, always and forever in my heart. My mom had one of those cloth Eloise dolls when I was a little girl. My mom loved dolls and for whatever reason my brother and I hated that doll, We used to call her "bad Susie" and we put her in the toilet. My mom pulled her out and tried to get her dried off, but she just became mildewy, I was probably about 4 and my brother was about 6, and we ruined my moms favorite doll...What a bunch of brats we were for doing that.....come to find out that the cloth Eloise doll can fetch some good bucks today. Sorry mom! Im good now. I love it so much I have persuaded (there may have been bribery involved) my six year old to be Eloise for Halloween this year. After all, this is the only Halloween in which she will be six. Hey, VKBMKL, I’ve recently discovered your blog and I just wanted to tell you it’s awesome. I’ll be looking for Eloise at the library, if I can find her. So glad I found you. And love the way you write, too. Wow what an awesome book. I will be getting this one for my little girl who at 2yrs old shows signs of being scarily like Eloise! Thanks.